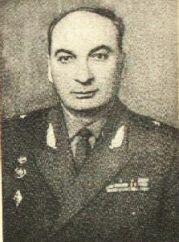 S.Kalitsov was born in Digora, North Ossetia. In 1942 he completed a full course at Kharkovskoe Aircraft Military School specializing in aircraft engines. During the war against German Nazis Kabolov served as a technical support service officer participating in many well-known battles, including the one at the Kursk Arch. After the war was over he completed a full course at Zhukovsky Air Force Military Academy. Then he held his service in many regions of the USSR.